Piaget Possession is the current object of our obsession. A ring is not just a piece of jewellery, it has symbolism. A ring is a complete circle, and a circle represents completion or totality. It can imply infinity and eternity. It can infer the cycle of life or the never-ending search for perfection. A complete or closed circle gives you the beginning and the end, the entire story in one smooth continuous, ever-flowing circle. But not all rings are complete circles. And just as complete circle has symbolism, so does an incomplete circle, or open ring. The open ring speaks of possibilities and chances, options and adventure. You may know the beginning of the story, but perhaps you are still somewhere in the middle, nowhere near the end yet. 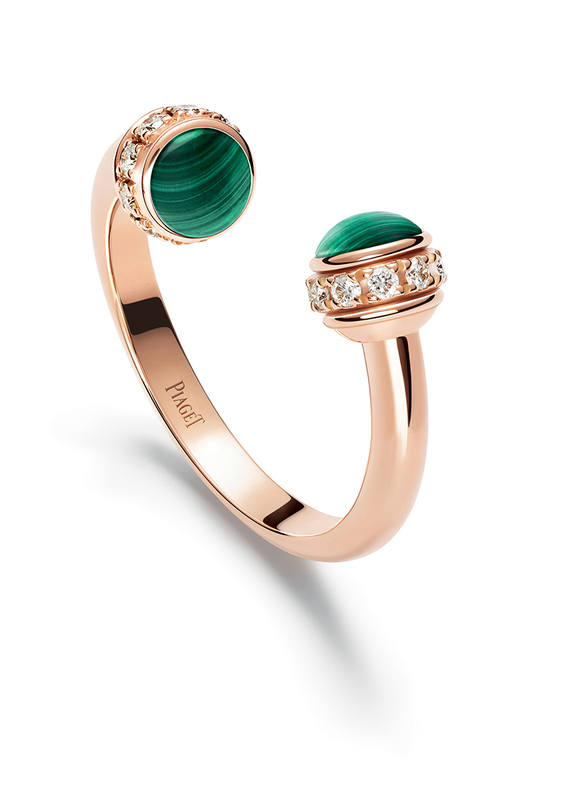 Piaget began it’s story – it’s ring, perhaps – in 1874 and has been creating timepieces and jewellery ever since. Their story has gone through some changes – imagine, the first workshop was in the family farmhouse – but they have stayed true to their dedication to excellence. The extraordinary creativity continues to inspire us. And yet, their story isn’t over yet. 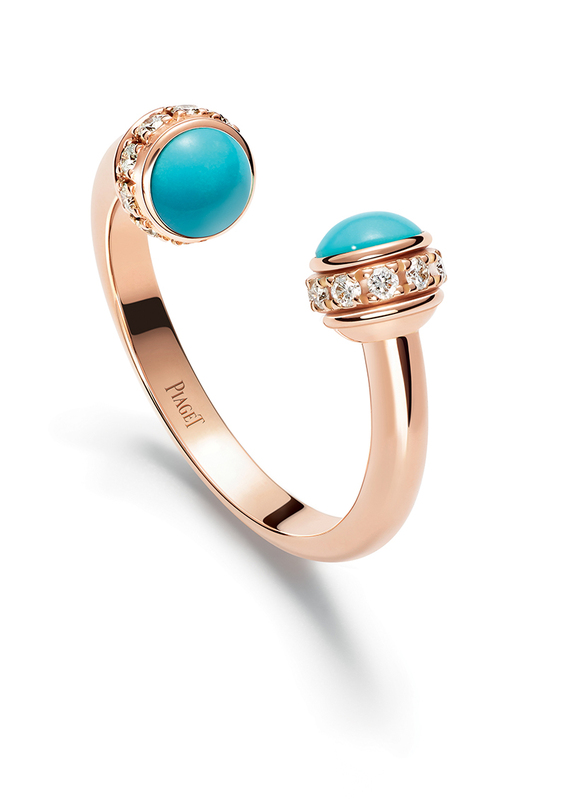 Piaget Possession is the current object of our obsession, and rightfully so. The open ring design is playful yet elegant, and an exemplary work of art. It is inspired by the open bangle, symbolic of dynamism and energy possessed by the lady. She calls the shots in her life, and she writes her story. The Piaget Possession open ring is in 18k red gold and features three different ornamental stones to choose from. The open ring is capped on each tip by a stone, and each stone is accented by a turning band paved with diamonds. The bands are a design wonder and frankly, a lot of fun. The added glamour courtesy of the diamonds doesn’t hurt either. The first option is the red gold ring with malachite. Malachite is deep green stone with parallel bands and concentric circles. The bands and circles add depth to the green stone, and each stone is unique, making each ring unique too. The second option is the red gold ring with turquoise. Turquoise is an opaque mineral that actually comes in a wide range of hues – blue, bluish green, green, and yellowish green. While the gemstone has been treasured over the years the most sought-after variation is the robin’s egg blue stone. Ironically, turquoise is composed of a hydrous phosphate of copper and aluminum – neither of which look like robin’s egg blue. The third option is the red gold ring with red carnelian. Carnelian is a glassy translucent stone, and is known as a stone of motivation and endurance. The red carnelian goes quite well with the red gold without looking comical. Maison Piaget has chosen the actress Jessica Chastain as their international brand ambassador. She embodies the Maison’s dedication to excellence and passion for perfection. She makes unexpected choices in her career yet seems to be enjoying every step of the way. She is still writing the story of her life, of her ring. Like Jessica, your story isn’t done yet. You have choices to make and adventures to take. Bring Piaget’s Possession with you on the journey of your life.